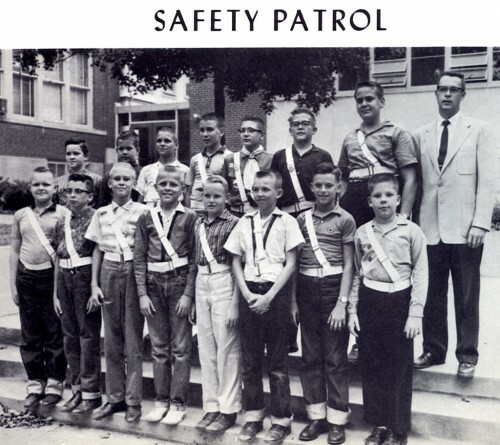 I was elected / selected / appointed Captain of the Trinity Lutheran School School Safety Patrol in the 8th Grade in 1961. Got to wear a special blue-trimmed badge. For some reason or another, I think I might have had one or more lieutenants who had red-trimmed badges to differentiate us from the peons with plain silver badges. I’m fifth from the left in the back row. Kent Verhines is to my left and David Hahs and John Hilpert are to my right in this 1961 school yearbook photo. Ronald Dost is on the right in the front row. I think everyone else was in lower classes and beneath the notice of us upper classmen. We learned how to fold and roll up our Sam Browne belts so you could hook them on your belt with the badge still attached. My Captain status gave me the ability to slip out of class to inspect my troops and issue demerits if I caught them slacking off. I was a little disappointed that I never caught anyone sleeping on duty. The troops were allowed to think I was authorized to use my Tuf-Nut knife to conduct a summary execution if that occurred. I must have gotten permission to take the family’s Bell & Howell 8mm movie camera to school one day. Looking back at it, I didn’t do too bad a job of shooting a variety of different angles and situations. A few closeups and some better acting would have made it better. Well this is some very fine video my man! I was a great experiance to have the Army under helmet on your head and the Sam Browne belt around you, with a real metal badge and put it on. It worked, when we were dressed in our gear we were different, we were patrol boys and NOBODY got killed on my watch! I’m going through and pulling out segments like these from about four hours of movies. I’ll try not to post too many of them in a row. You can handle only so much fuzziness in your life. My brother, Roger Beaudean, was a member of the Safety Patrol at Trinity Lutheran School. Sometime around mid 1960’s he was selected Patrol Boy of the year and won a trip to Washington D.C. I have the newspaper article with his picture somewhere. WOW How very long ago. I was a patrol boy at Lorimer School. I too remember the badge and rolling up the belt and attaching the badge to it. I remember standing at the intersection in front of Lorimer with a flag on a pole. First we would roll out the stop sign into the middle of the street and then use the pole/flag to stop traffic so our fellow students could cross. Thanks for the memory. It was impressed on us that we weren’t allowed to STOP cars. We had to wait until the intersection was clear, then we would would walk out into the street with our flags extended to protect our charges. If you were manly, you’d carry the stop sign out to the middle of the street.I was a roll-it-out kind of guy. Where is John Hilpert? He was the little kid next door until they moved to another neighborhood. I think of his family, his little sister Sally, every now and again! John M. Hilpert is president of Delta State University in Cleveland, Mississippi. He accepted this position in 2003 after six successful years as president of Northern State University in Aberdeen, South Dakota. During more than 30 years in higher education administration, he has also served as executive vice president and acting president of the University of South Dakota and as a vice president at Thiel College in Pennsylvania and executive assistant to the president at Suomi College (now Finlandia University) in Michigan. Ken that is the John Hilpert from the picture. Sally and I worked together at Bernie Public Schools. Sally and Charlie (Holt) are now living in Cape. CHS Class of 67’….. Far left ..bottom row..Maybe?…Tom Mueller-Mike Sample(my husband Brad’s best bud at CHS and Rolla Frat brother)-Doug Koch. …… TOO FUNNY:)..We are going to show this to Mike! Bottom left IS Tom Mueller. Left to right front row. Tom Mueller, Mike Sample, Doug Koch, Mike Ringwald, Dan Beard, Don Call, Dan (? )Birk, Ron Dost. Second row James Fuhrmann, ?, Larry Nussbaum, Kent Verhines, Ken, David Hahs, John Hilpert, and Allen Wehmeyer (seventh grade teacher and sponser. Ron Dost, Larry Nussbaum and Mr Wehmeyer are deceased. Small world! John and Sally Hilpert lived directly across the street from us on Dorothy St. I think I remember their address was 1066 Dorothy St. Our address at the time was 1067. They lived next door to Sue, John and David Rigdon(1068 Dorothy). If Sue thought John was a little kid, she must remember me as a rug rat. Sorry. Who I remember is your grandfather in is denim overalls sitting on the front porch! I don’t think I had ever seen overalls like that before… (city girl!) You’re right on the addresses…I still get Christmas cards from Mary Estes who was directly across the street from us! It was for me that John called you last summer re defeating the Lexus security system. Thanks for your help! I followed Ken’s advice and googled John Michael Hilpert. Quite a CV! I feel like we should email him and get him involved in this conversation! I think the young man second from the left on the back row is Rob Pensel. Second from left in back row is actually Ronnie Pensel. My Dad and his Dad were first cousins. His younger brothers are Tim and Robin. His nickname was “Pencil,” as I recall, not real original, but cute! P.S. That is me in the second row second from the left. My aunt just sent me a link to your site. I enjoyed reading about the old Trinity Lutheran Church. My sister and I attended school there. Our family moved from the area in 1968. My grandmother lived by a Catholic church and she lived her life by the bells. Five bells in the morning time to wake up, six bells breakfast, etc. Since they chimed every fifteen minutes, we always made back from playing in the neighborhood, to her house when we were supposed to be, even without a watch. I had forgotten that, thanks for bringing back such a great memory. Mark– that’s my older bro, Ron Pensel. Stumbled upon this site. Would I be able to use the “Safety Patrol” image for a project on how school safety has changed over the years?